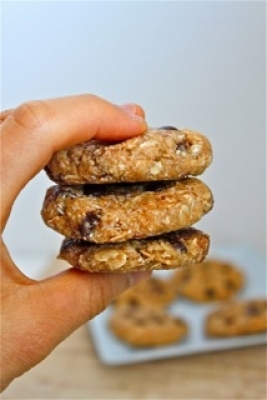 A delicious, no bake protein cookie which fits the bill for breakfast- high protein, good complex carbs and ready in under 10 minutes! 1.In a large mixing bowl, combine the rolled oats, oat bran, graham cracker crumbs, protein powder and salt. Set aside. 2.In a small bowl, combine the nut butter of choice and brown rice syrup and microwave for 2 minutes, or until melted. 3.Pour the wet mixture into the dry and mix until well combined. Add the milk then slowly incorporate the mini marshmallows, as they will start to melt. 4.Form into palm sized cookies and lay on a baking sheet or plate. Evenly top each cookie with chocolate chips and freeze for an hour or refrigerate for 4 hours/overnight.